The truth about climate change is being resurrected. No matter how hard the greedy oil merchants try, the truth keeps coming back to haunt them. The IPCC report on the devastating effects of climate change are real. We have to face p to the basic facts that Change Is Required Now. Many have said there is no climate change. Others have said that climate change is normal and not caused by man. Now the truth is being resurrected again. Every time greedy oil merchants and nuclear proponents say that it is not true they are wrong. I have been blogging for 5 months now. During this time many have see the truth about what is happening to our planet. Many have expressed how they feel about this subject in my comments. What is required now is some movement on the subject. We need to work together to stop the corporate greed that is destroying our planet. The representative in your country needs to know how you feel. If you live in the UK then you can write to your MP now. If you live in the USA then you can write to your member of Congress or Senate. If you live in the Peoples Republic of China, you can write to your Party Congress. I have posted many blogs in the past about building a renewable energy future today. Today I will show you some of the many places where you can help to support the cause. Your support is needed to help create our renewable energy future. There is a company called Good Energy here in the UK that is working on renewable energy today. You can help support Good Energy in several ways. Buying your energy from this company can help them gain the money they need to carry on further projects. If your run a business then they can help there too. Always help support efforts to create new renewable energy projects near you. Here is a link to the Good Energy public consultation schedule. Go to these meetings and support your right to a green and pleasant future. Right now we have the parts of a renewable energy system. We can put the pieces of the renewable energy puzzle together and make a brighter and cleaner future for all of us. Building the renewable energy future we need today is as simple as taking the right peices of the puzzle and placing them together. If this is the future, why do we delay and look to outdated ideas? This is where the problem lies. The current power system we have is run by corrupt governments and corporations. This corruptness is used to keep old ideas that are killing us and our planet. Nuclear energy is old and dangerous. Oil is destroying our climate and killing life on earth. Fracking is polluting our water and our land and killing us. The Wind is free and clean. The sun is free and clean. Hydrogen when burned creates water! 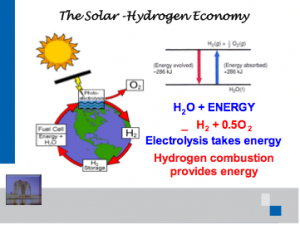 hydrogen when used to make electricity makes . . . water. 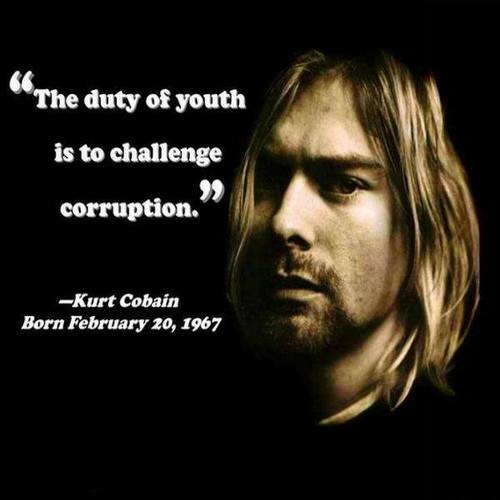 Lets start using our heads and get the corrupt corporations and governments out of the process. Let us take back control of the decisions that matter in energy production and use. Write to your representative in Congress and the Senate. Write to your party Member in Begiing. Send this blog link to your friends and get them to join the movement! It is now clear that putin* is an energy blackmailer. putin* has tried to blackmail the Ukraine into submission. putin* is now trying to blackmail the EU into submission as well. 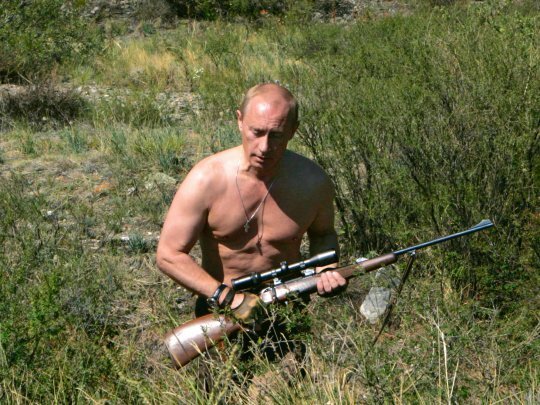 It is clear that putin* will hold a gun to the head of the EU and Ukraine. putin* thinks that he can get away with murder. He holds the gas and oil that the EU and Ukraine need to survive. Renewable energy would take away all putin’s power. The blackmailer putin* can be neutered by taking away his power. 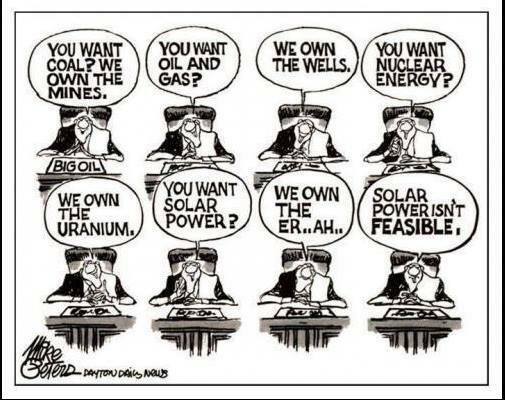 When we the people own the renewable energy systems that drive our economies we own the power. Using solar power, wind energy, hydro-electric, hydrogen fuel, and the power of the sun, we can neuter putin*. When we take control of the energy we have true democracy. In a democracy there are no bullies like putin*. Bullies who blackmail others are evil and must be put in a corner to chill out. A Blackmailer wold have a hard time holding all these different power generators. The large red square in the lower left of this picture is all the area needed to power the whole world. We do not need the KGB bully putin*. We don’t need his oil or his gas. When we the people take control of our energy systems we can design a renewable future for us all. We can create a world wide system that helps the people. The blackmailer will wither and die from a lack of power and control of energy. Write to your MP now and tell them to support the Desertec non-profit energy program today. 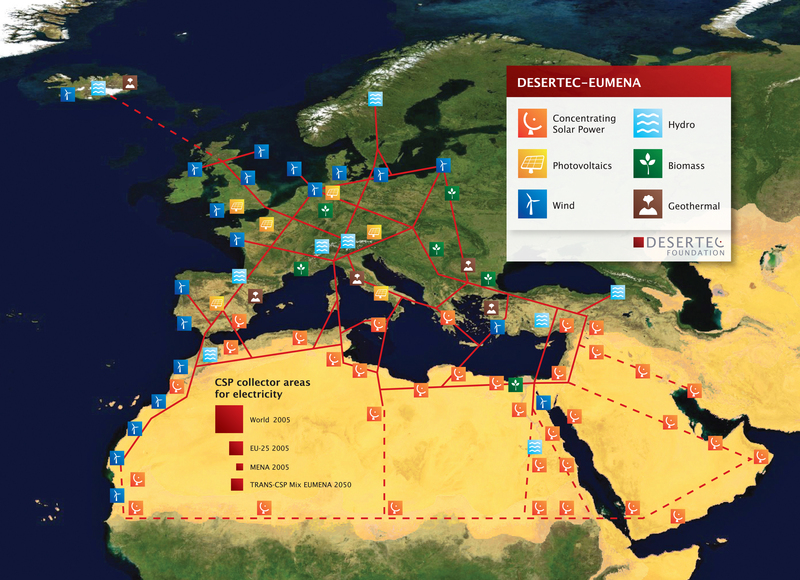 Join with Desertec today and help them change the world. *Please note: I have left putin’s name in lower case as a way of showing my contempt for a KGB bully. putin uses his ill gotten oil power to oppress the Russian people and Blackmail the EU and Ukraine. putin is nothing but a petty punk. There is overwhelming evidence that humans are experiencing the effects of climate change, says a new report. BBC News outlines the report’s key points – in 60 seconds. The atmosphere and oceans are warming, the snow cover is shrinking, the Arctic sea-ice is melting, sea levels are rising, the oceans are acidifying, some extreme weather events are on the rise, ecosystems and natural habitats will be upset. Climate change threatens food security and world economies. We need rapid and substantial cuts in carbon emissions and a move away from burning fossil fuels if we are to limit global climate change below two degrees and mitigate these impacts. 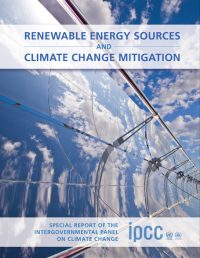 In order to stabilize the climate, the transition from fossil fuels like coal and oil needs to occur within decades, according to the final report this year from the UN’s Intergovernmental Panel on Climate Change (IPCC). All the Technology is here NOW! Lets make the change Today! In La Paz, where pollution from a dirty thermoelectric plant creates noxious air impacting resident’s lifestyles and well-being, the solar plant is a welcomed clean development. The $100 million project, which includes 132,000 solar panel-modules, is the first Mexican private enterprise of such a size to get a development bank loan and an agreement to sell its electricity to the grid. According to the Thomson Reuters Foundation, the International Finance Corporation, a member of the World Bank, gave the project a $25 million credit line and also helped set up another $50 million in loans from the Mexican development bank Nacional Financiera (Nafin). In La Paz, where pollution from a dirty thermoelectric plant creates noxious air impacting resident’s lifestyles and well being, the solar plant is a welcomed clean development. The $100 million project, which includes 132,000 solar panel-modules, is the first Mexican private enterprise of such a size to get a development bank loan and an agreement to sell its electricity to the grid. According to the Thomson Reuters Foundation, the International Finance Corporation, a member of the World Bank, gave the project a $25 million credit line and also helped set up another $50 million in loans from the Mexican development bank Nacional Financiera (Nafin). Wind power set a new record in Texas last Friday, heralding wind’s growing competitiveness with natural gas. As CleanTechnica reports, instantaneous output from wind hit an all-time high of 10,296 megawatts for Texas’ main grid operator — the Electric Reliability Council of Texas (ERCOT) — at 8:48pm on March 26, 2014. Wind energy generation fluctuates over time, so instantaneous output marks the peaks of the fluctuations rather than the average amount of output that can be expected. As ERCOT’s press release pointed out, at the moment of Friday’s peak, wind energy was contributing almost 29 percent of the 35,768 megawatts being used at the time. UK needs to step it Up! alphabetrevolution Big Oil, Energy Companies, Fracking, Hydrogen, NO HINKLEY C, Solar, Wind Energy Comments Off on Time to act is NOW! Humor is food for the soul. It can also be used to shed light on the truth hidden within an issue. Nuclear Insanity #2: Is the EU seeing the nuclear light? We are blessed to have so many brilliant minds creating our renewable energy future NOW! Let’s use them today to create the future we all want. The area of renewable energy production that we will explore today is called wave energy. This is, to pull a pun, the wave of the future. Using nothing more than the action of waves moving towards a beach, this design can harvest the energy within the wave. Electricity generated by this action is constant, like nuclear power. 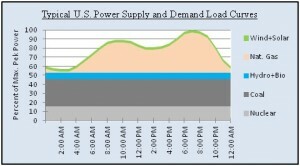 This graph is for the US grid but it is similar for the UK grid. Without a baseline of energy ‘charging’ the network of power lines, all your electricity production will sink into a black hole of energy loss. This black hole of demand is the grid itself. Wave technology that can harvest the power of our shores will provide a constant source of energy. This constant source can be used to power our renewable energy grid of the future. In our renewable energy future we wont have a power grid like the 19th century dinosaur we use today. Wave energy, wind farms, solar energy, and energy storage systems will make up our energy grid of the future. We can do this!The only thing stopping the progress of renewable technologies are the greedy lying corporate interests that are ripping you off with ever higher energy bills. These corporations are being helped by the likes of David Cameron and his cronies. Cameron has cut the Feed In Tariff, which cost UK workers between 30,000 – 40,000 jobs. Cameron then went to France to sign a new deal with EDF to build nuclear plants. Nuclear plants that the UK public have said over and over again that they don’t want. Nuclear plants that we would not need if the Feed In Tariff had been left alone to gradually reduce over time. Germany has created a mega solar industry using the same FIT method that Cameron trashed. Cameron has now changed the government target for the ECO program. We will see 10,000 more jobs lost. Energy companies have already canceled contracts with major suppliers of efficiency measures and taken away the funding that supported these jobs. We will miss our carbon reduction targets and people will die in their thousands because of Cameron’s greed. Germany employs over 300,000 workers in their renewable energy sector. We can do the same if we get Cameron and his Big Oil Cronies out of the way. Wave technology is moving forward in Scotland. Jobs are being created. We can do the same thing in England. Please tell your MP to stop the madness and the greed of Cameron. Our future is at stake! alphabetrevolution Big Oil, Energy Companies, NO HINKLEY C, Solar, Wind Energy Comments Off on Nuclear Insanity #2: Is the EU seeing the nuclear light? I used to have a great job. I went to work earlier than normal. I worked more than 8 hours a day, and I made a good wage. I sold insulation, boilers, and solar energy systems for home owners. They all loved their upgraded homes and their PV systems and are now enjoying the benefits of the FIT. They are warm and have lower energy bills. David Cameron cut the FIT payment scheme by more than half and the great job ended. I was out of work, unable to support myself or my family. The higher tax rates I had been paying to the government turned into a JSA – Job seekers allowance payment to me. I was not alone. The entire division of my company that used to sell and install solar systems went under. The parent company was bought for peanuts by a capital investment company. More workers lost their jobs. Estimates are that the radical and needless cut in the FIT tariff caused around 40,000 to lose their jobs. I have finally found a new job working for a big company selling insulation, boilers and solar systems. This company had contracted with the BIG 6 energy suppliers to use their ECO contributions to help those families in fuel poverty. Over 2 million homes in the UK have problems with energy bills and have to chose between heating or eating. I have blogged in the past regarding the rip-off rises in electricity and gas over the last few years. Cameron has wrongly blamed these rises on the ECO and Green Deal programs that the government has put in place. This is not true. The cost increases are due to greedy energy suppliers who are manipulating the wholesale cost of energy and then passing the charges on to YOU the poor consumer. They make lots more money each time they do this. Now Cameron is pushing back the ECO targets. Eco funding was set to help the poor and unfortunate who can’t heat their homes because it costs too much. New boilers and insulation in an older home will help reduce the costs of heating a home. It will also reduce our dependency on foreign fossil fuels and remove the need to frack in the UK. The more energy efficient we become as a nation the more we become independent from foreign energy suppliers. Greater efficiency leads to reduced need, which leads to no new nuclear power plants being build. Reducing our energy usage also helps us to meet the carbon targets we have agreed to reach. Our climate is changing and we are paying the price with greater storms and flooding. We need to change our ways to help our climate and our country. David Cameron has decided to use the fraudulent rises in energy prices as an excuse to cut funding to the ECO program. Employers have already begun laying off staff because the energy companies have said they don’t have to fund these programs any more. The cut in funding has been immediate. The loss of jobs has been as fast. Has your bill gone down yet?? Mine hasn’t gone down. IF your bill does go down please comment on this blog so I can spread the good news. I don’t expect to see allot of comments. Cameron is once again helping his friends in#stead of you. Cameron is cutting government support for ECO like he did FIT and we are paying the price with climate change, new nuclear plants, fracking, and a loss of jobs. Write to your MP and tell them to return the ECO funding now! Blame the Wind Farm: They Are Making Too Much Energy! What happens when the wind blows in the UK? We get cheap electricity from wind farms right? Er.. well no that is not happening. The national grid is paying for windmills to stand idle because they have too much energy on the grid. In a process called Grid balancing the grid operator Transco pays out millions to wind farm owners, and other electricity producers, to stop them from making energy. Previous blogs on this site have discussed the need to upgrade the electric grid in the UK. Providing a smart grid for our renewable future is one step in the right direction. If we owned the national grid we could start building this smart grid and save almost £ 500 million pounds a year in ‘Constraint Payments.’ Transco wants you and me to pay for this grid upgrade with more money while they make record profits. I thought that capitalism worked in a different way. If I pay for resources and then produce something, I need to charge enough to make back what it cost and a bit more for profit. Transco is making record profits and wants to increase your bill to pay for a modern Grid system! It used to be that a company would invest some of its profit into buying new equipment to become more competitive. Transco has no competitor so they can do what they want. In the USA the renewable energy marketplace is in an even worse state. The power companies are now charging the owners of solar roof top systems for ‘maintenance for the grid.’ Needless to say that folks in Arizona are not rushing to buy solar systems. It is a real shame too. Arizona could be free of the need for a utility company or a grid operator if they just build more rooftop solar systems. Arizona has a LOT of sun that is going to waste. The energy operator in that state is still making big profits on the backs of the good folks that might be getting energy for free. Welcome to Corporate America! Will we see this kind of pressure put on the renewable movement by the energy industry in the UK? I think we already are seeing this happen! More later in the saga of renewable energy VS the energy Goliaths. alphabetrevolution Energy Companies, Solar, Wind Energy Comments Off on Blame the Wind Farm: They Are Making Too Much Energy! I have been posting about David Cameron’s lack of Green credentials for some time. Yesterday we saw again how Cameron is willing to put the full weight of his government and the media behind a destructive and needless energy policy that helps Big Oil and not you. All the environmental damage that will be done can be avoided. Previous posts here have shown clearly how fracking creates earthquakes and environmental damage. Supporting renewable energy technologies like solar wind and Hydrogen can solve our energy problems and get us off oil and gas dependency. Cameron and his Big Oil cronies would rather bribe your local council to get access to that gas regardless of the destruction that will happen. Step 1 was gaining ownership of the electric and gas grid in the UK. The national grid is, like any corporation, looking to make a profit. The cost of these profits adds 25% to the cost of your electricity and gas bills. If we buy back the grid then these costs can be reduced or eliminated. An Ofgem spokesperson told the BBC that over half of the £12 bill increase was not due to physical investment in the network, but was instead because of a change in accounting rules which would mean that energy firms could no longer claim back tax on the cost of replacing parts of the network. Step 2 is to start building the grid system we need for a renewable energy future, today. The first step is to increase the grid storage capacity. In California new legislation is forcing the grid operators to build these new storage systems. We must have the ability to store excess energy produced using renewable energy. The ability to store and then use this energy is key to creating our renewable energy future today. Ask your MP why we are not doing this now.